So I wanted to wait until it was actually available to purchase but I’ve been informed that it’s not going to be available for a couple of weeks. That’s okay, you can still buy the first two volumes and I have also been uploading the chapters every month on comixology. And trust me, I will let you know when it’s available. 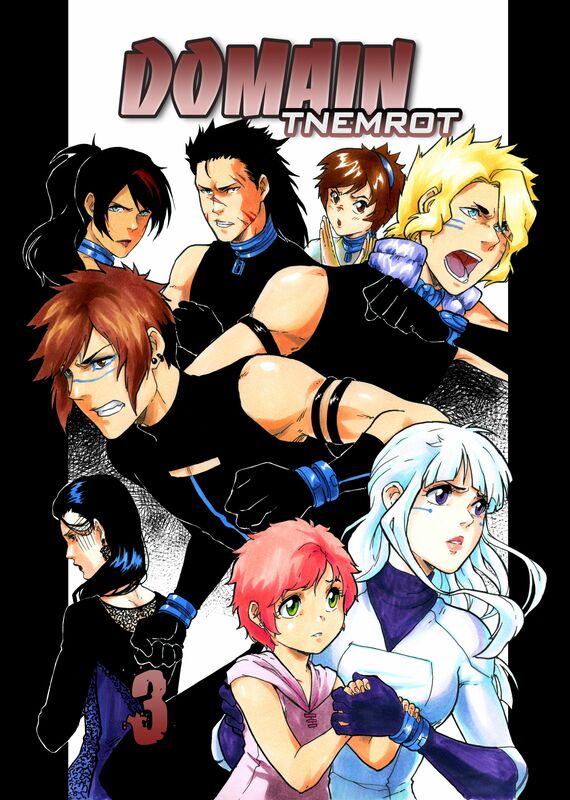 For those of you unaware of what Domain Tnemrot is, between 2010 and 2015 I had another manga webcomic I had created back when I was sixteen and then revamped into the version above, illustrated by Tatiana Lepikhina. It was one of my most successful print books at cons, finding a small but dedicated audience who were amazing and the reason I wanted to get this out. Unfortunately, the audience was not enough to sustain the comic. Online, we averaged only a few thousand hits a day and even though people said nice things, it turns out a lot of people are not interested in reading the manga format as a webcomic. So after the site went down one too many times, I just left it. But now, and I’m so glad I can finally bring this out, we have the third and final volume coming soon. See how it all ends, hear about how the war started, what year it actually is and what will happen to the heroes. It all comes to a head as Dae, Angel and Haze go up against Morris and Jason the Ref. As for LWI, we apologise for the delay, Fer has been busy with other pro-level work and because he’s a full time artist with a family, including a new baby, that needs to be his focus. But we should have something for you guys soon. Thanks for sticking by us guys. Amazing. Only a few hours before you posted this, I’d been wondering how you guys were doing, since (as far as I could tell) you’d appeared to have been on a media blackout for several months. Then a new item plopped into the RSS feed, and I wondered no more.